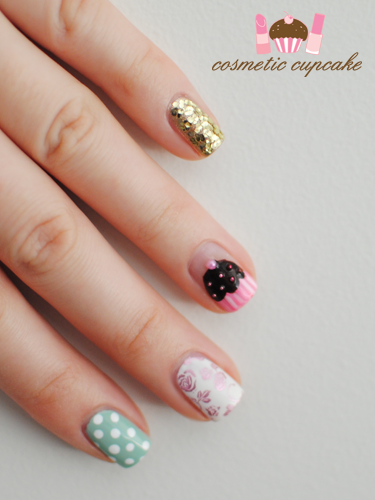 Cosmetic Cupcake: My ABBW manicure! I'm currently still compiling my ABBW post for you which is going to take a while so I thought I'd show you the mani I rocked for the weekend first =) My blogging backlog is CRAZY at the moment due to my darn flu so please bear with me! I didn't know what I wanted so I actually brainstormed mani ideas a few nights before - something I never get around to doing! My sis always tells me to trial manis first on a nail wheel or paper because she's the one who has to help me remove polish if a design goes pear shaped haha! Pic below is what I instagram-ed during my brainstorming ;) (I LURVE instagram so if you have it please let me know! 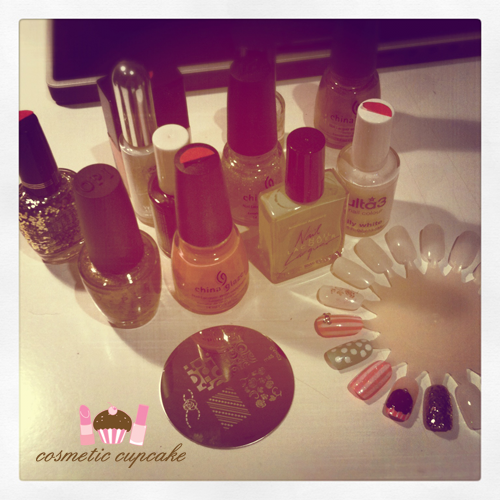 You can follow me too - cosmeticcupcake). Thumb: I used 2 coats of China Glaze Empowerment as a base and added vertical stripes using Kiss nail art striper in white. Index finger: I used 2 coats of American Apparel Office and stamped full dot design from Konad plate m79 using Konad Special polish in white. Middle finger: I used 3 coats of Ulta 3 lily white and stamped full roses design from Konad plate m65 (one of my favourites!) using China Glaze Admire. This colour combo is one of my absolutel favourites. It works EVERY time! Ring finger: My cupcake! I used 1 coat of Butter London Pink Ribbon for a sheer base. For the cupcake liner, I used China Glaze Empowerment to freehand a thick french tip and added white lines using Kiss nail art striper in white. For the cupcake, I used Ulta 3 chocolate cake and added red bullions for the sprinkles and a pink half pearl as the cherry. Unfortunately the bullions bled! Pinky: I used 2 coats of OPI Glitzerland and a few coats of Milani Jewel FX in Gold for some bling. What do you think? Thanks for looking as always ladies! Beautiful and so clean! I love it. 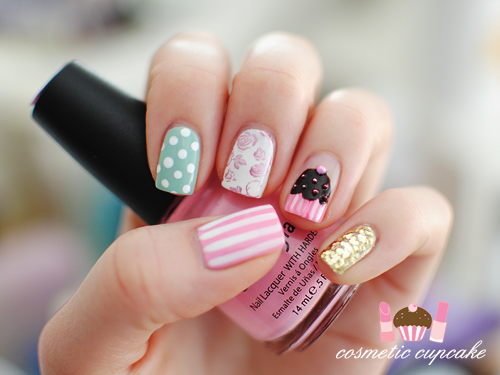 Those are the cutest nails ever! I love every single nail!! Loooooove it my darlin! And hey hey.....guess who's a brand new owner of Milani Jewel Fx Gold?!?! :D Woo! I ove your manicures and how they are so INTERESTING. They are never the same and you pay such close attention to detail. Your nails are always inspiring. LOVE your mani to death. this is sooo adorable!! <3 <3 I love your manicures! @With love, Ana. : Thank you! @Minty: Glad you like it Minty! I can't help make my manis neat and tidy. If not I have to start over again! @l y n: Lol thanks Lyn. @Floor: I'm so glad you like it!! I love doing manis like this. @thenailaholic: I love doing different designs for each nail. It makes it interesting and fun! @rock-or-not: Happy to hear you like it! @Mandy: Oh you make me blush Mandy!! Thank you for your kind words ^_^ I get bored easily so having different designs on my nails keeps me occupied! @Silke V: Glad you like this colour combo too! Pink, white and green just go so nicely together. I'll make sure to look you up! @MSodapop: The cupcake smudged unfortunately but I think it turned out ok! @Val: Awwwwww thanks Val!! It was so awesome to meet you - you are such a wealth of knowledge! oh my goodness, those are the most awesome nails EVER!! They are so cute! totally wish I could do that with my nails but I'm so incompetent with nail art!